I’ll be speaking about optimization this Wednesday at the Online Marketing Summit conference in Santa Clara, CA. Since I’m very comfortable with the actual topic, most of my prep time has been spent looking for pictures for my slides. 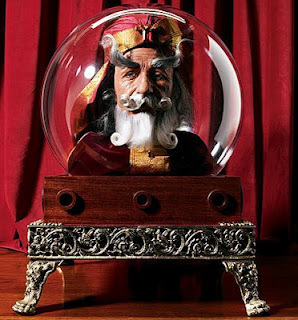 One discovery was the image above, which shows is how I think most people imagine optimization: a team of dead-serious revenue engineers carefully tweaking dials and watching gauges until they find the perfect balance among alternative marketing investments. That the real world isn’t quite so rigorous is a sad truth I’ll cover during the conference. But this picture isn’t just any power plant. 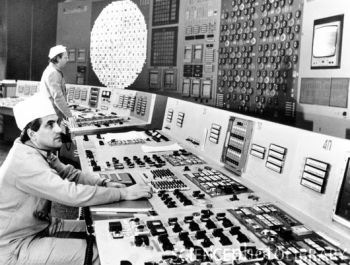 It’s the control room at the Chernobyl nuclear reactor which disastrously exploded in 1986. Look closely, and what do you notice? Yes, those hats. Apparently the Chernobyl plant was being run by pastry chefs. That explains so much. Well, maybe that didn’t happen. But my imaginary pastry chefs sound a lot like stereotypical marketers: experts in a subjective field where decisions are based on taste, feel, and appearance, and progress comes through intuitive experimentation. Those methods work well in the kitchen, but can’t be safely transferred to a nuclear reactor. Nor do they work for marketing optimization. Like reactor management, marketing optimization programs need to be based on deep knowledge of the underlying process. They rely on precise tracking mechanisms that support long-term monitoring of detailed results. They need to be run by marketing equivalent of nuclear engineers, not pastry chefs. This doesn’t mean that data geeks should take over marketing. Chances are, things weren’t going very well in the Chernobyl bakery that day, either. The city needed both bakers and scientists. But having them wasn’t enough: they needed each in the right place. Marketing departments are the same. Epiphany was one of the high-fliers of an earlier marketing automation boom: launched in 1997 with an initial public offering in 1999, it traded stock for a full suite of marketing and CRM systems before its price collapsed. The remains were scooped up in 2005 by SSA Global, which was itself purchased in 2006 by enterprise software vendor Infor. Through all this, the company’s products continued to sell with little change. 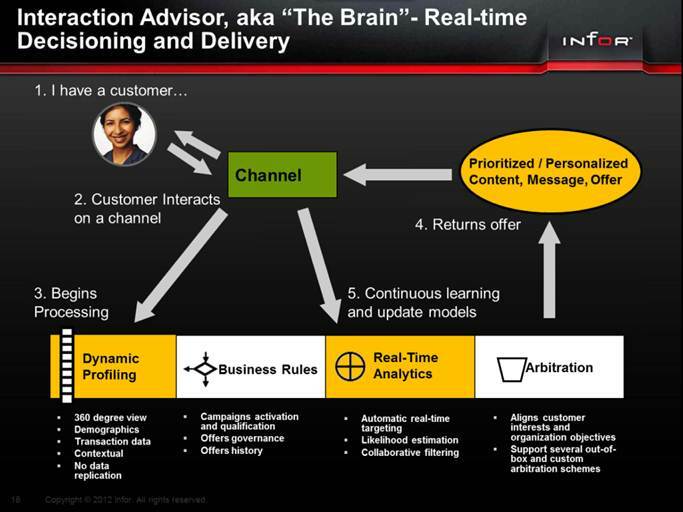 The crown jewel turned out to be RightPoint, a pioneering real-time interaction manager now called Interaction Advisor. Infor has recently renewed its commitment to the Epiphany line, increasing investment in the product and its marketing. Recent improvements include a unified interface for inbound and outbound campaigns, tighter integration among its components, greater scalability, support for more channels, and pre-packaged solutions for specific applications. The vendor has integrated with Orbis Global for marketing resource management and has an AppExchange integration with Salesforce.com. A new user interface is planned for next year. As I noted in yesterday’s post, B2C marketing systems like Epiphany have actually been more popular acquisition targets than B2B products. Since many readers of this blog are unfamiliar with the B2C products, it’s worth taking a detailed look at Epiphany’s components. 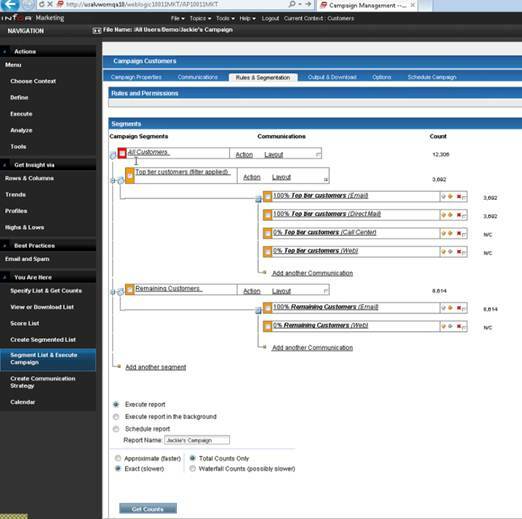 Let’s start with the marketing automation product, Infor Epiphany Marketing. This sits on a marketing database built outside of the system; part of the set-up is mapping that to Epiphany. This is already a contrast to B2B marketing automation, where the database is part of the system and structures are largely limited to contacts, accounts, and marketing interactions. In addition to the external data, Epiphany does maintain its own database of operational components. These are arranged in a standard model including programs, which can contain multiple campaigns, which in turn can have multiple communications (messages) and cells (contact groups). Communications can be shared by multiple cells, and one cell can use multiple communications. Each communication may contain one or more creatives, which are specific bits of marketing content. Campaigns, communications, and cells can all be assigned to output channels. The model also contains segments (sets of customers or prospects), events (campaign triggers, which can be based on time, channel, behavior, queries, or feeds from external Web services), and packages (sets of campaigns used for Interaction Advisor). Campaigns can be divided into waves, each with its own schedule. The schedules can have a fixed date, recur at fixed intervals (from minutes to weeks), or be triggered by events. Events can be captured as they happen, but the system still pushes the responses to a queue to batch the replies. The queue might be cleared as often as each minute for near-real-time messaging such as a purchase confirmation email. It might wait longer for media such as direct mail, where there are significant economies of scale. Bear in mind that this limit applies only to outbound campaigns: Interaction Advisor provides true real-time response to inbound interactions. Users can also create global marketing rules that apply across campaigns. These help to enforce regulatory constraints, such as age restrictions or opt-out compliance, or company policies such as limits on the number of messages within a time period. The structure I've just described is substantially more complicated than most B2B marketing automation systems. That complexity adds some cost, but it also lets users can more easily manage shared components and analyze results by communication, channel, program, segment, and other groupings. This is hugely important in managing marketing programs with hundreds or thousands of components, a typical B2C requirement. Epiphany campaigns are set up by assembling segments in a hierarchical tree, splitting them into cells if desired, and assigning a communication to each cell. Rules and segmentations are built with a powerful query builder that can read any data in the system, including transaction details, and supports relative dates, value ranges, events, ranking (e.g. 100 highest-revenue customers), and negatives (e.g., has not bought a specific product). Again, this is typical of B2C systems, while B2B query builders are sometimes more limited. Beyond campaign management, Epiphany Marketing provides integrated data mining and predictive models; advanced reporting and visualization, including use of report cells as campaign segments; an executive dashboard; global permissions and security management; and the Orbis Global integration for marketing calendars, workflow, digital asset management, and financials. These are rarely available in B2B marketing automation systems, although exceptions exist. Epiphany Marketing has its own email engine. It actually supports two kinds of dynamic content. One is your everyday dynamic content, where rules within the email determine what’s shown to each recipient. The other, which Infor calls “true” dynamic content, can change the contents after a message is delivered. It does this by calling back to Interaction Advisor for a selection based on current information. Neat trick. On the other hand, Epiphany Marketing currently lacks an end-user tool to build emails or landing pages. This is one feature found in even the mostly lowly B2B systems. But gap exists because Epiphany and other B2C systems were designed primarily for large organizations where content is created by full-time designers or external agencies. Infor plans to add a content builder next year, and other B2C vendors will probably do the same if they haven't already. So much for Epiphany Marketing. It’s neither the best nor the worst B2C marketing system. But it’s a good example of what those products provide and how they differ from B2B marketing automation products. Interaction Advisor, on the other can at least make a plausible claim to leading its industry. With nearly 200 installations, it may well have more clients than any competitor – systems including Oracle Real Time Decisions, IBM Unica Interact, Pega Next-Best-Action Marketing, SAP Real-Time Offer Management, and a host of others. These systems all work roughly the same way. They connect with external customer-facing platforms, usually Web sites or call centers, which alert them when a customer or prospect starts an interaction. The systems pull information about the customer from the external system and other sources, apply rules and predictive models to recommend a treatment, and send the recommendation back to the customer-facing system for delivery. The connections with external systems are made through Application Program Interfaces (APIs) provided by those systems, so the interaction managers handle those pretty similarly – although there are some differences in the types of connections they support. The more important variations are in their internal decision-making process. Specific considerations include the complexity, scope and difficulty of creating rules; the predictive modeling methods and user requirements; and how the system reconciles conflicting priorities in making its final recommendation. Interaction Advisor handles all these quite nicely. The vendor divides the process into four steps: dynamic profiling (gathering the data); business rules (selecting options to consider); real-time analytics (self-managing predictive models); and arbitration (selecting the best option based on user objectives). In practice, the process starts with a call from an external system. This could be triggered by a tag embedded in Web page or call center screen. The call contains information about the current customer and the context. It carries the identity of an Interaction Advisor event, which tells the system what campaigns to apply and how many recommendations to return. The system might need several responses to display multiple ads on a Web page or to give a call center agent some choices. When the call is received, Interaction Advisor creates a session that will remain open until the interaction is complete. It stores the data it received in memory and then queries other systems, such as the company’s marketing database, customer files, and inventory systems, to assemble whatever other data it needs. This is also stored in memory: there is no persistent customer profile within Interaction Advisor although some information generated during the interaction will be stored permanently. The system then executes the rules, which first activate the specified marketing campaigns and then determine which offers within those campaigns are available to this customer in this situation. (For example, the system might exclude offers within the campaign for products the customer has already purchased or recently rejected.) There might be additional constraints such as ensuring that offers relate to the contents of the originating Web page or don’t include conflicting products. Once the eligible offers are identified, the system activates its predictive models. Interaction Advisor supports two types of predictions: Bayesian models that estimate the likelihood of the customer responding to one specific offer, and collaborative filtering that identifies offers most commonly selected together. Both are self-generating and self-tuning, so human model-builders are not needed. The Bayesian models do provide reports on which attributes have the most influence on the likelihood score. These provide useful business insight and let users check that the models are reasonable. The system keeps a record of offers made and accepted, which is essential for the Bayesian modeling technique. The final step is arbitration. This looks at the likelihood scores for the eligible offers, the value (revenue or profit) from each offer, and perhaps other considerations such as inventory levels or sales quotas. Users set up arbitration rules depending on their priorities: they might want to make the offer most likely to be accepted, the offer with the highest value, or the offer with the highest expected value (i.e., likelihood x value). One arbitration scheme can apply across multiple events, even if they involve different campaigns and offers. Once the offers are chosen, the system passes the customer-facing system a content ID that tells it what to display. Interaction Advisor could also store the content internally and send it instead of an ID. But most users prefer to let the customer-facing system to manage its own content. The call-and-response cycle just described applies to a single interaction. Interaction Advisor doesn’t execute multi-step dialogs like a call center script or sequence of Web pages. Users could accomplish that indirectly by creating different events that call different rules, or by creating eligibility rules that take into account previous activities. Since sessions remain active for a user-specified period of time, previous events within the sequence are all immediately available. However, sessions are channel-specific, so a customer simultaneously looking at a Web page and talking to a call center agent would have two independent sessions active. At best, the data in those sessions could be shared by posting it to an underlying database. Posting also makes the interaction history available to in the future. Products like Interaction Advisor often generate substantially more revenue than manual recommendations. They are priced accordingly: a single-channel Interaction Advisor installation starts around $150,000 and could run much higher. Fees are usually based on the number of users in a call center or sales agent environment, or the number of recommendations or visitors in an automated environment like a Web site. Most clients install InteractionAdvisor on-premise, although hosted options are available. 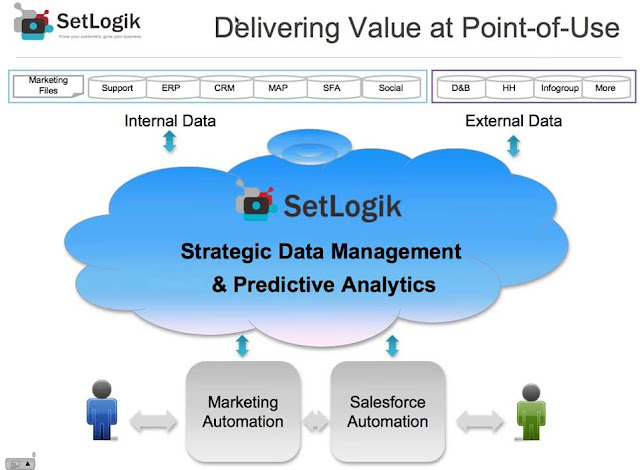 I’ve now done more detailed research into the SetLogik B2B data management system I mentioned in my Dreamforce post. If anything, I’m even more impressed. 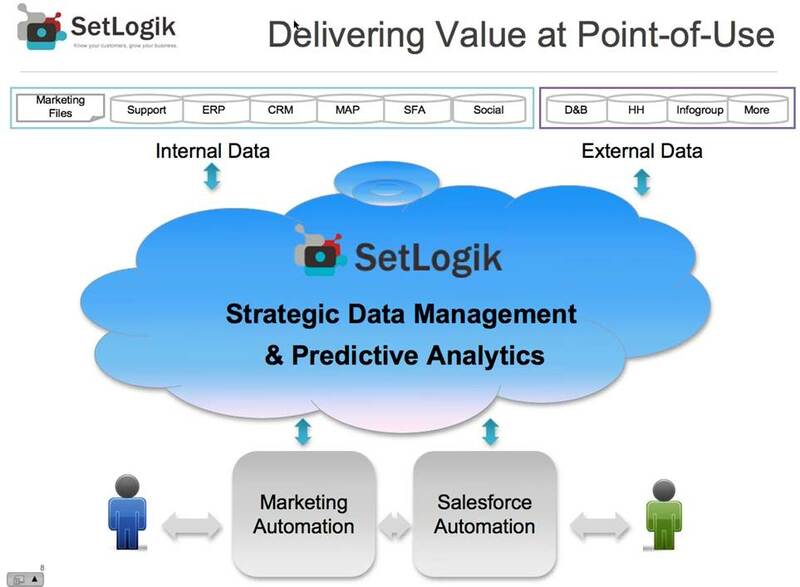 I originally saw SetLogik as a tool to associate marketing leads with sales opportunities, even when they are not connected directly within Salesforce.com. That’s important in itself, since those missing links are the greatest obstacle to showing the value of B2B marketing efforts through revenue attribution. But the bigger story, which SetLogik itself recognizes clearly, is that they’re creating a real marketing database. This has been sadly lacking in most B2B marketing automation systems, which supplement the Salesforce.com database with barely-extensible lead profiles and contact histories. In fact, I’ve recently taken to citing the B2B systems' fixed, built-in database as the fundamental difference distinguishing them from B2C systems, which connect to externally-managed databases with any structure. SetLogik doesn’t replace the database built into the B2B systems. Rather, it creates a separate database that merges data from marketing automation, Salesforce.com (or, potentially, any other CRM system), and whatever other sources a company has available. The matching capabilities that initially caught my eye are just one part of a larger suite of functions to load, clean, standardize, merge, and enhance B2B data, ultimately storing it within a database where it can be used with SetLogik tools for segmentation, selection, reporting (including attribution), and predictive model-based lead scoring. Cleansed data and results such as lead scores can be fed back into CRM and marketing automation systems for direct access by their users. SetLogik’s own diagram expresses this separation reasonably well, although I would have suggested they clarify that there’s an independent, persistent database within their cloud. As consumer marketers learned long ago, building a serious marketing database is a big project. The challenge is even greater in B2B, which manages two data levels, companies and contacts, instead of just one level of consumers. It’s no wonder that B2B marketing automation vendors avoided the issue by piggybacking on the Salesforce.com structure: otherwise, the cost and complexity of building a separate database would have severely limited their growth. SetLogik’s addresses the problem directly, by creating a nearly-automated system to build the database. The company promises to deliver a completely functional database within 60 days, and to deliver the database plus predictive lead scoring models in 90 days. Compared with the many months or years needed to deploy a traditional marketing database, this is lightning quick. I call the system “nearly-automated” because a SetLogik analyst works with each client to set up the data preparation steps, tweaking the standard rules and processes as necessary, and because the predictive models are also built by human analysts. These are advantages, not flaws, since a skilled user adds substantial value to both processes. The system still does most of the work, so the initial data quality set-up takes just a few hours of labor – although the full process typically takes several days because clients need time to make decisions. Similarly, modeling takes about two weeks – again, more wait time than work time. In fact, the model building is so efficient that the company includes it for free in its Enterprise edition, which starts at $1,400 per month for up to 25,000 records. None of this would matter if the quality of SetLogik’s results were poor. But, while I haven’t run a test, the company certainly describes the features I'd want. Standard inputs include leads, contacts, campaign members, accounts, and opportunities from Salesforce.com, plus leads and activities from marketing automation. Data preparation includes standardization and verification of addresses in the U.S., Canada, United Kingdom, Australia; phone numbers verification for North America; email format verification (but not sending test emails); table-based transformations and coding for elements like titles and sales territories; and enhancement with client-licensed external data such as D&B listings. The matching engine uses multiple rule sets, supports both similar and exact matches, and can compare data across several fields (such as mobile vs. home vs office phone number). The system will match at individual and company levels and can link individuals to companies. It will choose the best value for each field and return a consistent best record to all source systems. Predictive modeling can include derived variables, such as number of emails received, as well as raw inputs. The system’s database stores snapshots of old data values so it can track changes and trends. New and changed records run through the system at user-determined intervals that can be frequent as hourly. The system doesn’t provide an interface for end-users to set their own data processing rules, although one is planned. As SetLogik correctly argues, very few B2B marketers have the interest or skills to do this. In fact, the company’s larger problem is that so few marketers even recognize they need better data cleansing, let alone a separate marketing database. This will likely limit SetLogik's initial clients to the upper tier of sophisticated marketers who do see the problem. We can hope that the importance of a serious marketing database will eventually become clear to everyone. SetLogik is a Software-as-a-Service application, available directly from the company or through the Salesforce.com AppExchange. The system has an Eloqua connector today and a Marketo connector in the works. The company promises basic implementation in 60 days, although it is usually much less, and full implementation including predictive modeling in 90 days. Pricing is based on the system edition and number of records (unique individuals and companies). The Express Edition, starting at $500 per month for 25,000 records, builds the database and feeds the cleansed, enhanced records back to Salesforce.com and marketing automation. Professional Edition, starting at $1,000 per month, adds segmentation, list building, attribution, and other reporting. Enterprise Edition, starting at $1,400 per month, offers all the other features plus predictive lead scores. The price tag gets more serious for large systems – Enterprise costs about $11,000 per month for one million-records – but is still much less than a conventional marketing database. In fact, SetLogik points out that some services built into the price, such as address and phone verification or access to lead profiles within Salesforce.com, would ordinarily cost nearly as much as the entire SetLogik fee if purchased separately. SetLogik officially released its system in October 2011 and now has several large enterprise clients. As I mentioned in my Marketing Automation Beer Goggles post, KXEN introduced a free lead scoring app for Salesforce.com users at Dreamforce. KXEN has since given me a closer look at the lead scoring product, underlying technology, and future plans. First for details on Predictive Lead Scoring itself. As originally reported, it’s free and requires no configuration to set up. The trade-off for this simplicity is users have no control over which variables are included or what the models predict. The variables will include all standard and custom fields on the lead object, which isn’t too bad except that there might be useful data on related objects such as activity details. At best, marketers could summarize such data and add the summary to the lead object, but that requires human intervention. Predictions are limited to conversions from lead to contact. This isn’t always what you want, but it does stay within the lead object’s contents. Some of these limits might be relaxed in future versions of the app. However, KXEN is wary of making deployment more difficult or letting users make poor decisions such as removing variables they should keep. The system does provide reports showing the contributions made to the scoring formula by different variables and by values within those variables. Recognizing that this is already more than many users will care to review, KXEN plans to add simpler reports over time. Although the lead scoring app attracted more interest than KXEN expected, it was really developed to illustrate the power of KXEN’s new “Cloud Prediction” model-building engine. This uses the same automated modeling methods as KXEN’s established on-premise product. What’s new is a REST API that lets external applications send inputs over the Internet, wait while the engine builds a new model, and then receive the completed model formula. Scoring happens within the external application itself – Salesforce.com in this case – allowing the system to update scores as Salesforce data changes without running on KXEN’s own servers. Similarly, the app relies only on data stored within Salesforce.com’s own database, so KXEN doesn’t have to keep a copy. The limits of the lead scoring app are a design choice: the cloud prediction API allows as much end-user control as KXEN’s on-premise system. But KXEN isn’t planning to expose the full API any time soon. Instead, it's pursuing the app-based model as a way to expand use of its technology beyond its current base of relatively skilled users. The next Salesforce.com app KXEN will release – pretty much any day – will tackle prediction of the “next best activity” for a given customer. This is substantially more complicated than the lead scoring app, since it creates a separate predictive model for each activity and then chooses the activity with the highest probability of response in each situation. This one won’t be free: list price is $50 per user per month. The next best activity app also requires more user effort to set up, since users must define the activities to model and specify eligibility rules for each activity. 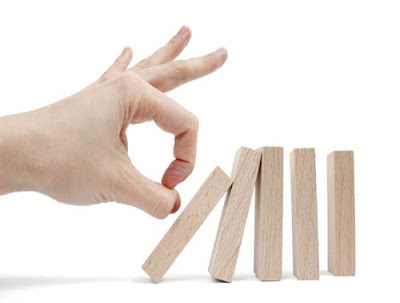 The system recommends activities randomly at first, to build some experience with different situations. After the initial models are built it will still make occasional random selections to keep the models current. Unlike lead scoring, the next best activity app reads from several Salesforce.com data objects in addition to the lead object. Eventually, users will get control over which data elements to include. The next best action app also relies on data stored within Salesforce.com. It won’t store a full history of offers made and rejected, because this would take more data than Salesforce.com can economically hold. That means the system won’t know when agents decide not to make the recommended offer. This can be a problem because the models based on a user-selected subset of cases. It's a common issue with recommendation systems. Whether these and similar issues cause serious problems for KXEN's cloud modeling apps remains to be seen. Some amount of skilled human intervention may be essential to apply modeling effectively. But it's worth exploring what's really needed: the ever-growing volumes of data and decisions make low-cost, automated predictions increasingly important for marketing success.